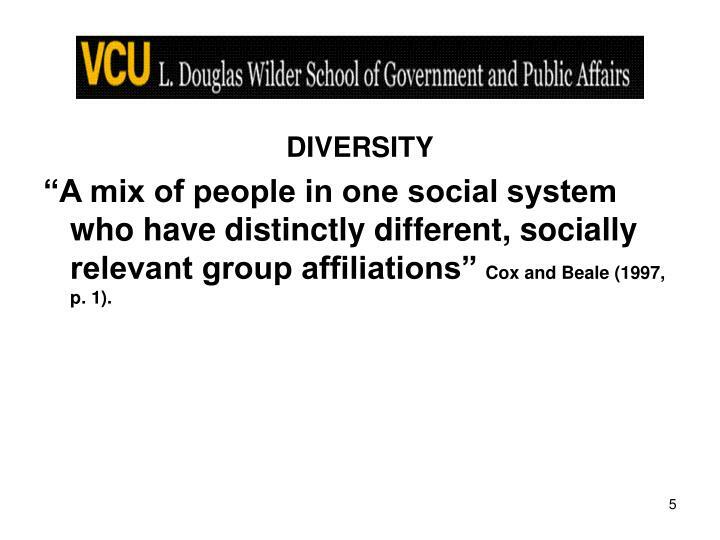 “A mix of people in one social system who have distinctly different, socially relevant group affiliations” Cox and Beale (1997, p. 1). 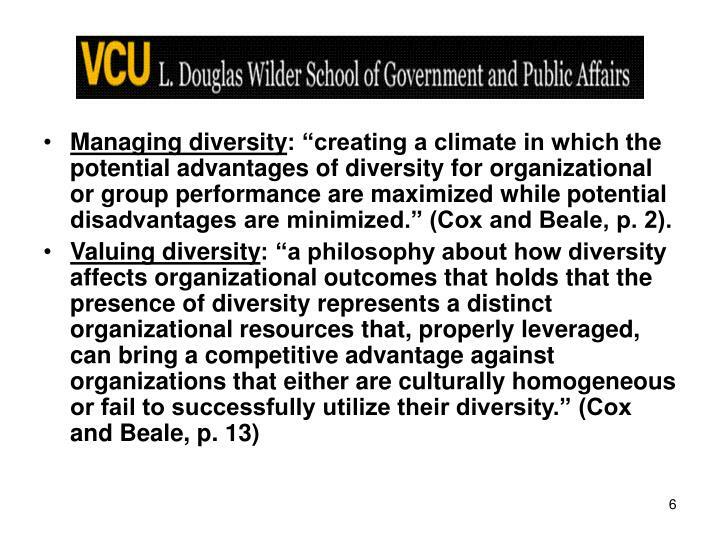 Managing diversity: “creating a climate in which the potential advantages of diversity for organizational or group performance are maximized while potential disadvantages are minimized.” (Cox and Beale, p. 2). Life attitudes are not randomly distributed through the population. 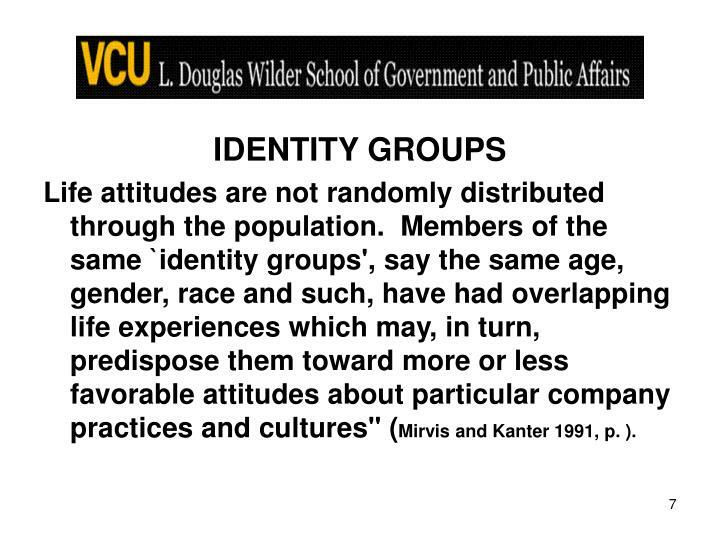 Members of the same `identity groups', say the same age, gender, race and such, have had overlapping life experiences which may, in turn, predispose them toward more or less favorable attitudes about particular company practices and cultures" (Mirvis and Kanter1991, p. ). While White males comprised 51% of the workforce as recently as 1980, they are projected to make up only 44% of the workforce in the year 2005 (Galen, 1994) and 43.5 % in 2014 (Toossi, 2004). 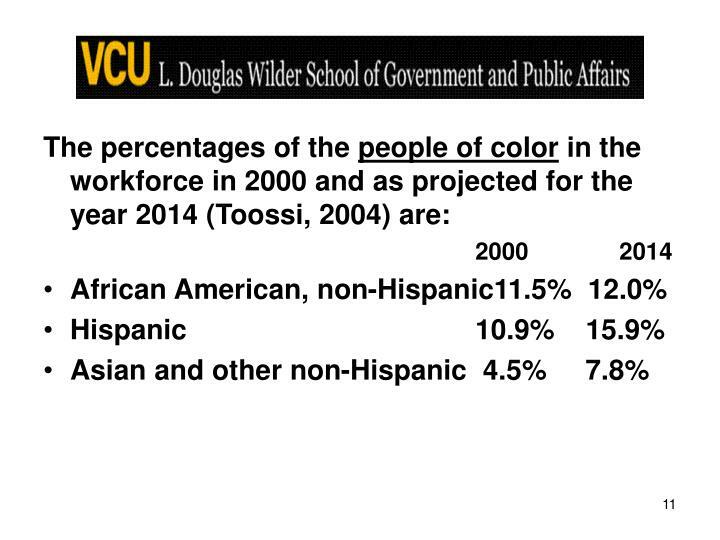 In fact, when you subtract the Hispanic population, the percentage of the workforce that is white, non-Hispanic males is projected to be only 34.9% in 2014, down from 43.7% in 1988, and 39.8% in 1998 (Toossi, 2005). It is estimated that women will make up 46.8% of the workforce in 2014, as compared with 45.2% in 1990 and 46.6% in 2000 (Toossi, 2005). 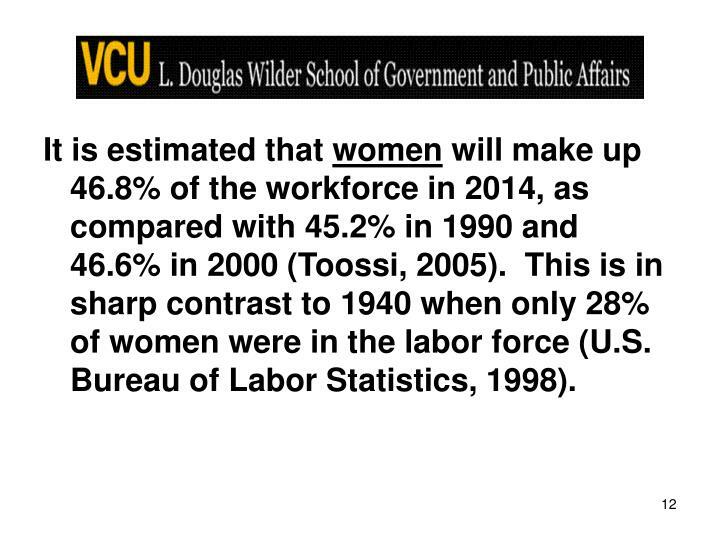 This is in sharp contrast to 1940 when only 28% of women were in the labor force (U.S. Bureau of Labor Statistics, 1998). 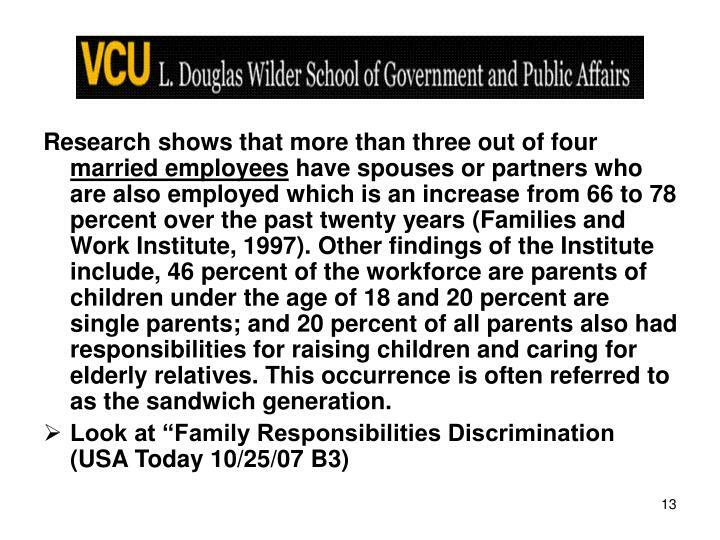 Research shows that more than three out of four married employees have spouses or partners who are also employed which is an increase from 66 to 78 percent over the past twenty years (Families and Work Institute, 1997). 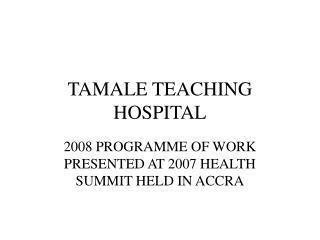 Other findings of the Institute include, 46 percent of the workforce are parents of children under the age of 18 and 20 percent are single parents; and 20 percent of all parents also had responsibilities for raising children and caring for elderly relatives. This occurrence is often referred to as the sandwich generation. The number of known gays and lesbians in America is not an easy number to derive considering the obstacles many homosexuals face when openly admitting their sexual orientation. 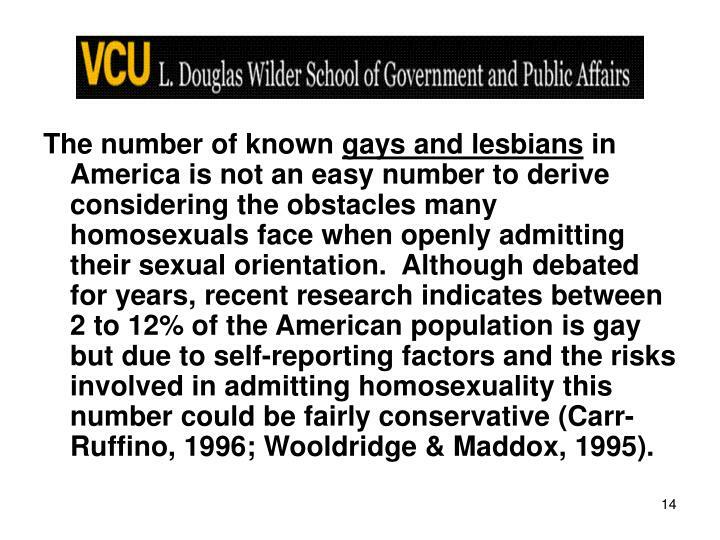 Although debated for years, recent research indicates between 2 to 12% of the American population is gay but due to self-reporting factors and the risks involved in admitting homosexuality this number could be fairly conservative (Carr-Ruffino, 1996; Wooldridge & Maddox, 1995). 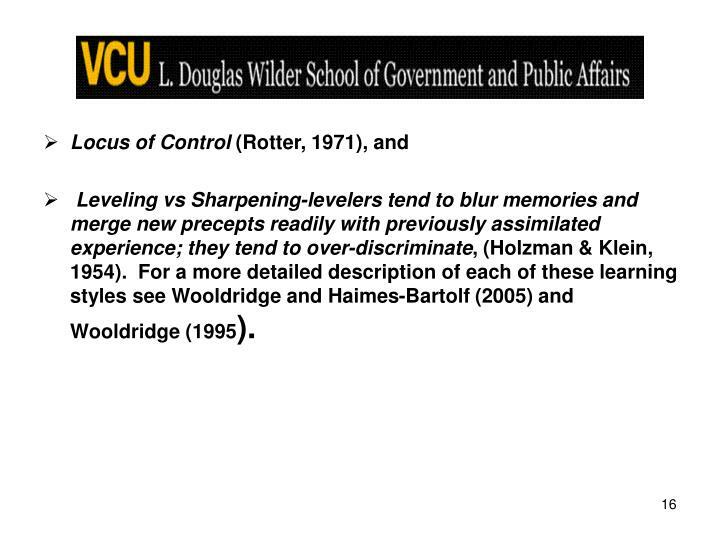 Leveling vs Sharpening-levelers tend to blur memories and merge new precepts readily with previously assimilated experience; they tend to over-discriminate, (Holzman & Klein, 1954). 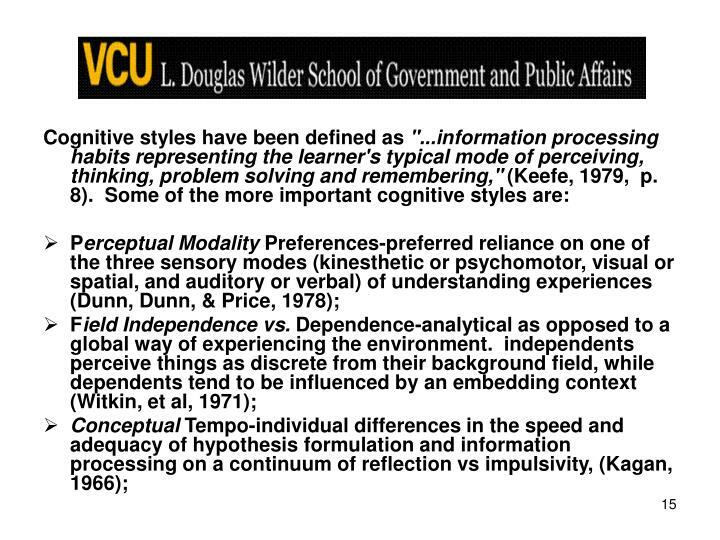 For a more detailed description of each of these learning styles see Wooldridge and Haimes-Bartolf (2005) and Wooldridge (1995). 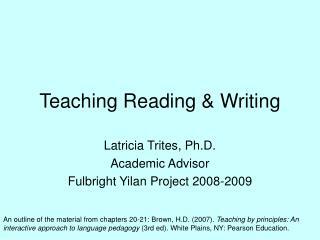 Other research indicates that half of the adult work force does not read, write, or compute well enough to perform their work satisfactorily (Ford, 1992). The U.S. Department of Education estimates that the functionally illiterate now account for 30% of the unskilled, 29% of the semiskilled, and 11% of the managerial, professional and technical workforce. 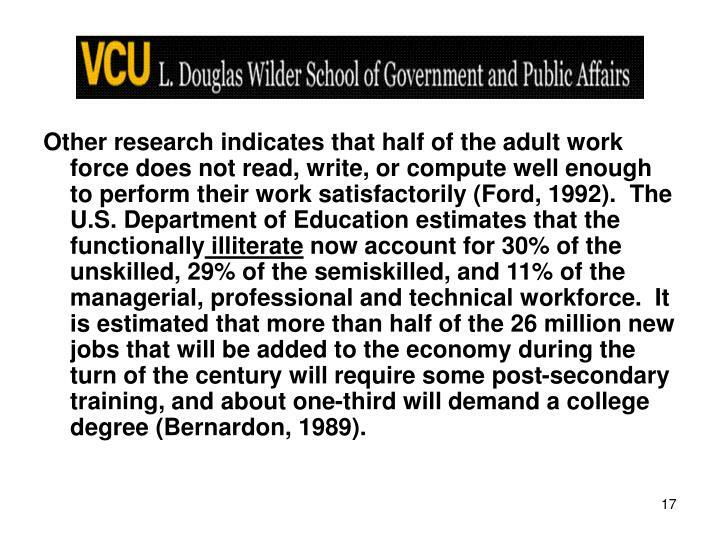 It is estimated that more than half of the 26 million new jobs that will be added to the economy during the turn of the century will require some post-secondary training, and about one-third will demand a college degree (Bernardon, 1989). 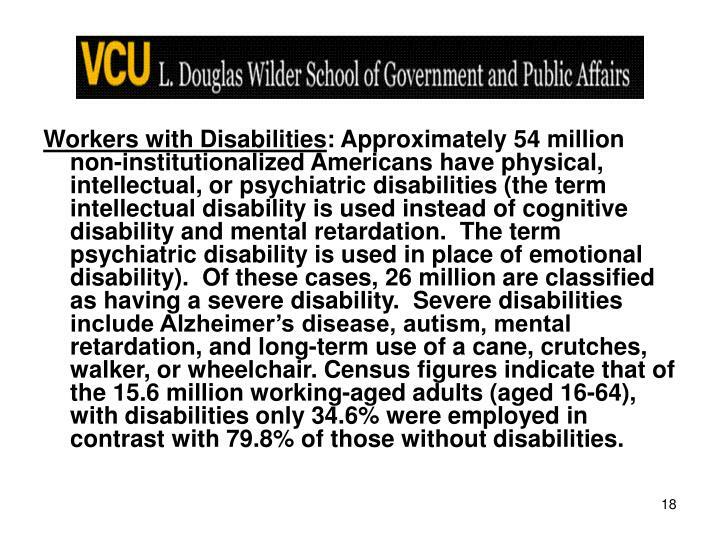 Workers with Disabilities: Approximately 54 million non-institutionalized Americans have physical, intellectual, or psychiatric disabilities (the term intellectual disability is used instead of cognitive disability and mental retardation. The term psychiatric disability is used in place of emotional disability). Of these cases, 26 million are classified as having a severe disability. Severe disabilities include Alzheimer’s disease, autism, mental retardation, and long-term use of a cane, crutches, walker, or wheelchair. Census figures indicate that of the 15.6 million working-aged adults (aged 16-64), with disabilities only 34.6% were employed in contrast with 79.8% of those without disabilities. 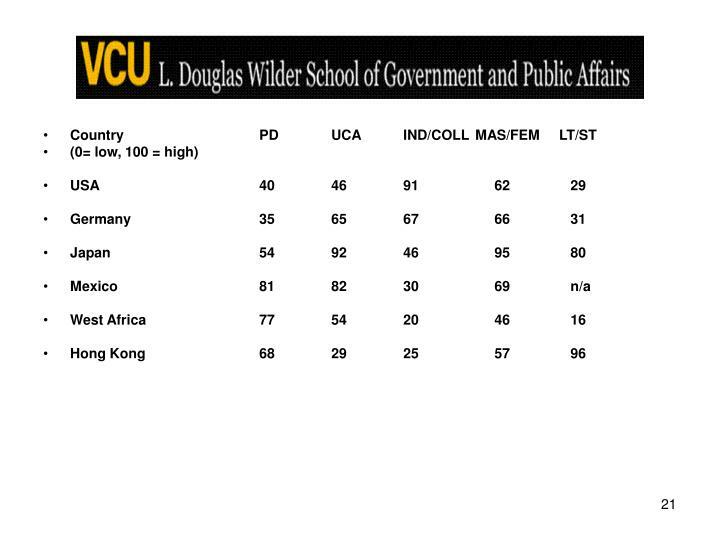 Power Distance “The degree of inequality which people consider normal; from relatively equal (that is small power distance) to extremely unequal (large power distance)” (Hofstede, 1994, p. 5). Uncertainty Avoidance The degree to which individuals prefer structured over unstructured situations. Range of acceptance that risk is a normal part of every day life. Individualism/Collectivism refers to which individuals prefer to act as individuals rather than as members of groups. 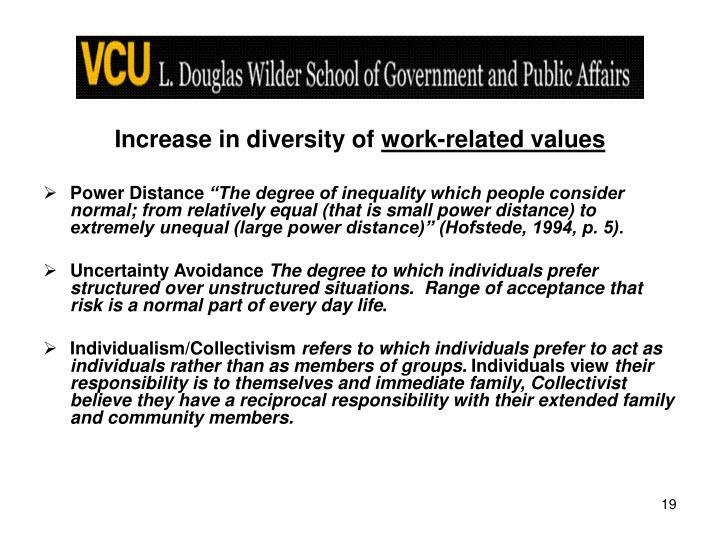 Individuals view their responsibility is to themselves and immediate family, Collectivist believe they have a reciprocal responsibility with their extended family and community members. 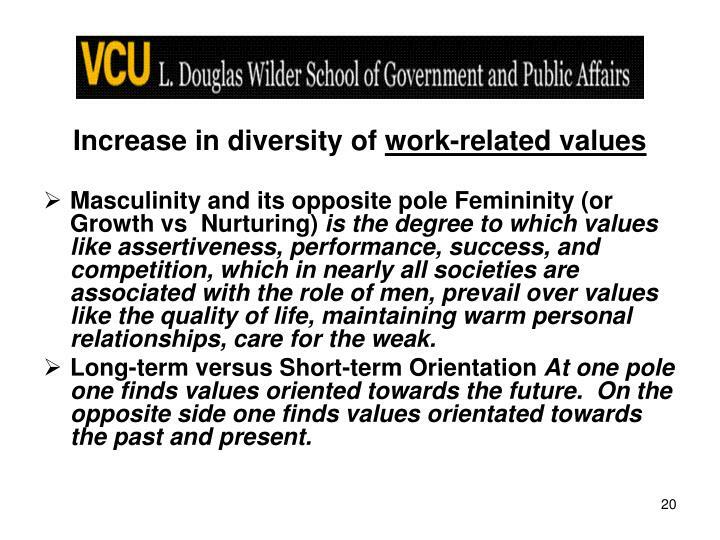 Masculinity and its opposite pole Femininity (or Growth vs Nurturing) is the degree to which values like assertiveness, performance, success, and competition, which in nearly all societies are associated with the role of men, prevail over values like the quality of life, maintaining warm personal relationships, care for the weak. 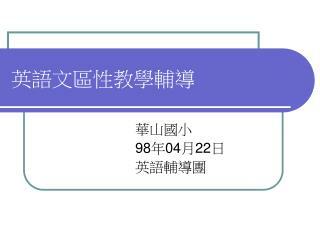 Long-term versus Short-term Orientation At one pole one finds values oriented towards the future. On the opposite side one finds values orientated towards the past and present. 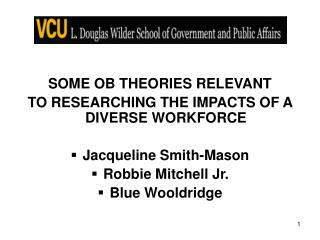 As a result of changing demographics, nontraditional work arrangements are increasing. A survey of CEO’s in Fortune 500 companies showed that 44% rely more on temporary, part-time, leased, and contract workers than they did five years ago, and 44% expect to rely more on external workers in the next five years than they do now (Fierman, 1994). Based on the Bureau of Labor Statistics’ definition, contingent workers are those persons who expect their jobs to end in a year or less or report their jobs as temporary. There are an estimated 5.4 million contingent workers in the United States (Monthly Labor Review, June 2001). In addition to contingent workers, the bureau refers to classifies independent contractors, temporary workers, on-call workers, day laborers and those employed by contract firms as workers employed in alternative work arrangements. The February 2001 labor survey found 8.6 million independent contractors (6.4 percent of total employment), 2.1 million on-call workers (1.6 percent of total employment), 1.2 million temporary help agency workers (0.9 percent of the employed), and 633,000 contract company workers (0.5 percent of total employment). In 2006 it was estimated that there were four generations currently in the workforce-Matures (The “silent generation”) were about seven percent of the work-force, Baby Boomers were about forty-two percent, Generation Xers were about twenty nine percent, and the millennial generation about 22 percent . “Workers didn’t always mingle in the workplace with the generations the way they do today” (Eagan as quoted by Hilton, 2001 August, p. 53). Older workers as an increased percentage of the workforce: In the year 2014, the median age of the workforce is projected to be 41.6 years up from 34.8 years in 1978, 36.6 in 1990 and 39.3 in the year 2000. In 2014 twenty-one and two tenth percent (21.2%) of the workforce will be older than 55 years as compared with only 13.1% in 1984, 15.6% in 2004. 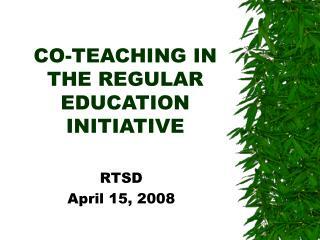 (Toossi, 2005). 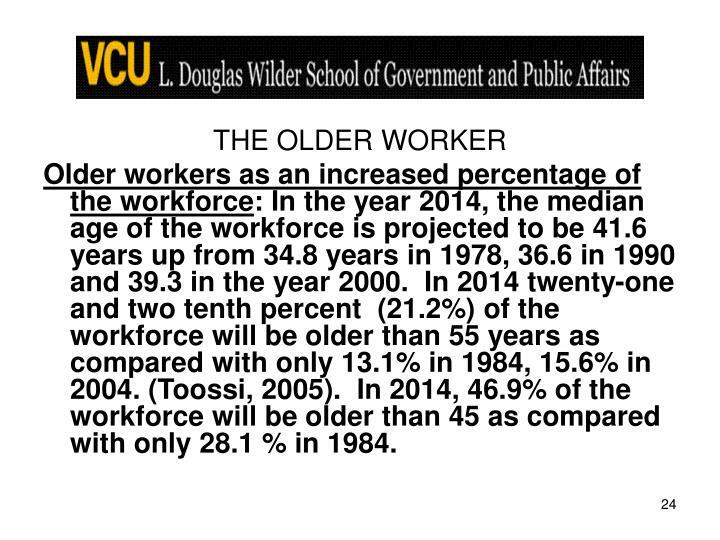 In 2014, 46.9% of the workforce will be older than 45 as compared with only 28.1 % in 1984. The group of individuals that have come to be known as Generation X has been much the center of attention in recent literature concerning management and employees, education and training. 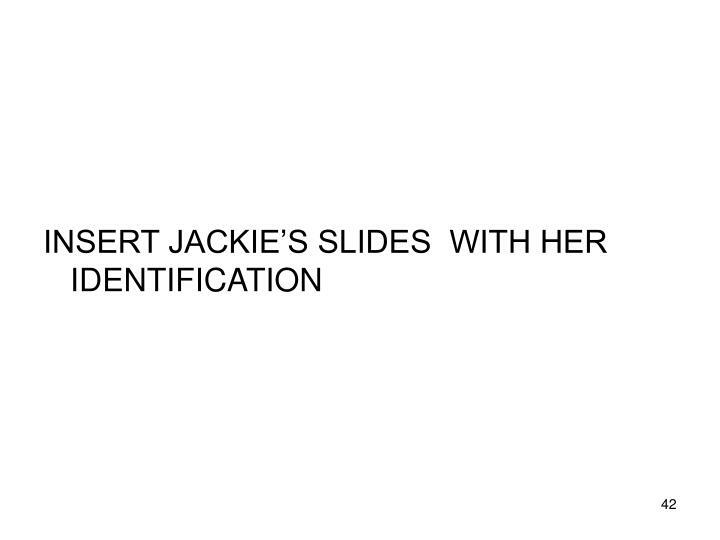 As usual, stereotypes have evolved and negative opinions have been formed and reinforced. 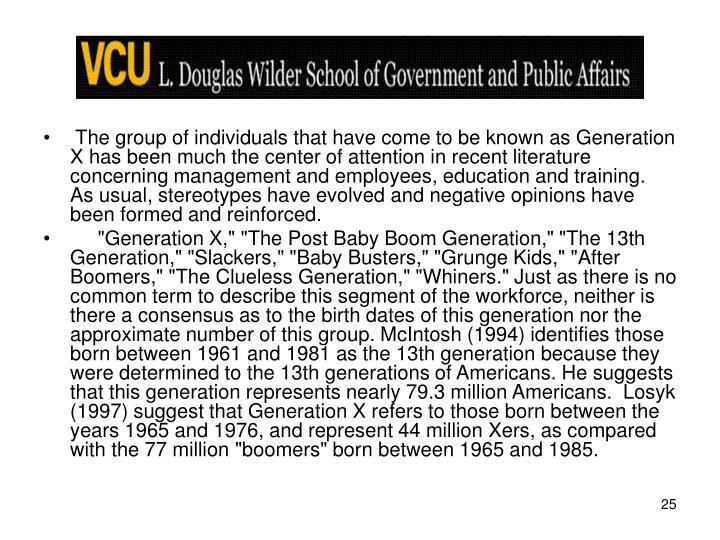 "Generation X," "The Post Baby Boom Generation," "The 13th Generation," "Slackers," "Baby Busters," "Grunge Kids," "After Boomers," "The Clueless Generation," "Whiners." Just as there is no common term to describe this segment of the workforce, neither is there a consensus as to the birth dates of this generation nor the approximate number of this group. McIntosh (1994) identifies those born between 1961 and 1981 as the 13th generation because they were determined to the 13th generations of Americans. He suggests that this generation represents nearly 79.3 million Americans. Losyk (1997) suggest that Generation X refers to those born between the years 1965 and 1976, and represent 44 million Xers, as compared with the 77 million "boomers" born between 1965 and 1985. Members of Generation X place a high priority on education and training. "People in Generation X view training as a way to improve their chances of getting promoted," (as reported in Lynch, 1998, p.1). 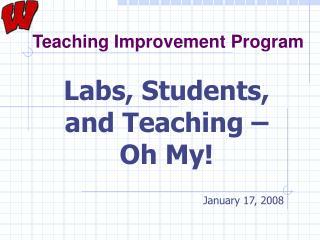 Schaaf (1998) found that younger workers give training higher marks than do older workers. Generation Xers tend to make job decisions based on whether training is available. 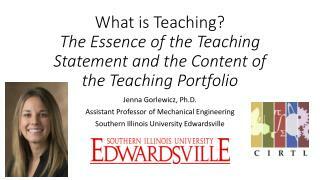 "The organizations that provide continuous education are in a better position to retain productive employees" (Caudron, 1997, p. 24). This view is supported by the research of Bova and Kroth (1999) which reports that Generation X employees place a very high value on workplaces that support continuous learning. Halford (1998) refer to those born after 1980 as Generation ”Y”. “The pace of business is changing dramatically. 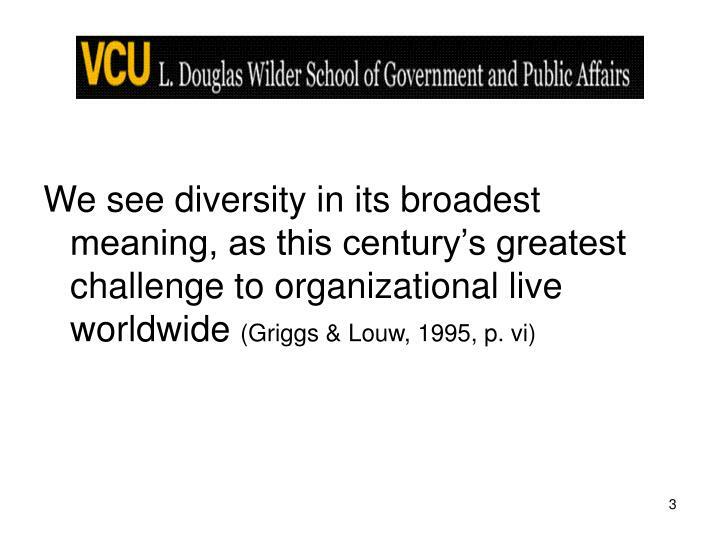 That’s why understanding … Gen Y is crucial to businesses today” (American Demographics, 2001, September 1, p. 6). 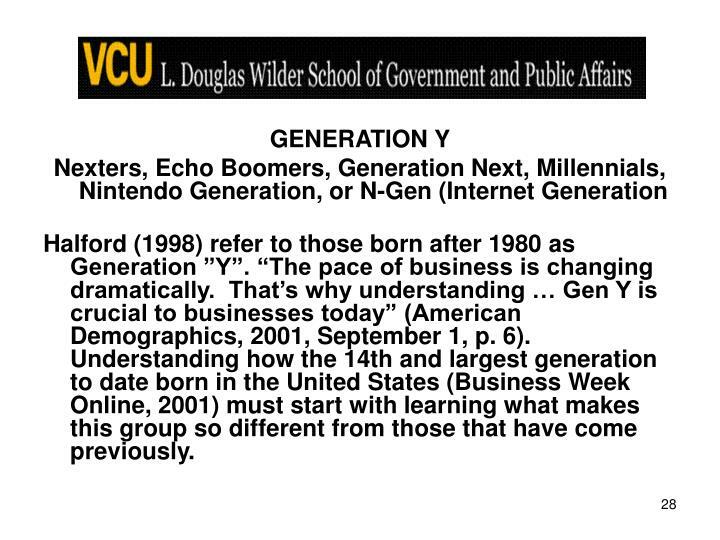 Understanding how the 14th and largest generation to date born in the United States (Business Week Online, 2001) must start with learning what makes this group so different from those that have come previously. In sheer numbers alone this group encompasses between 71 – 76 million people spanning the age range of those preparing to enter kindergarten, preteens or “tweenies”, teenagers, and young adults. 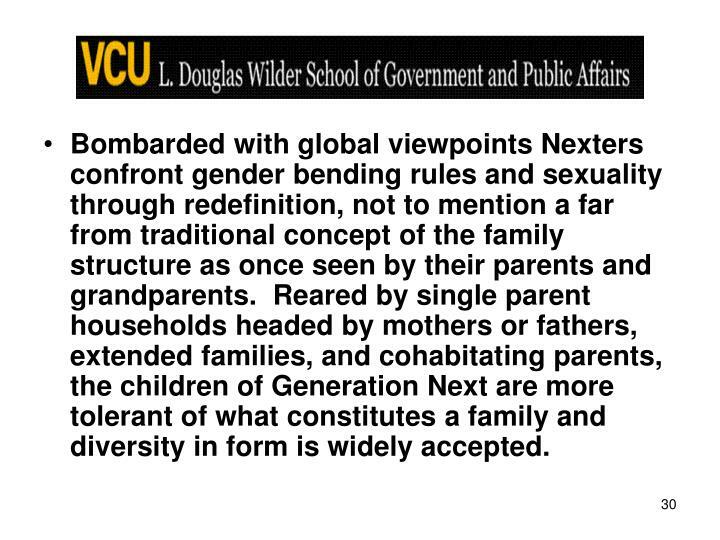 Bombarded with global viewpoints Nexters confront gender bending rules and sexuality through redefinition, not to mention a far from traditional concept of the family structure as once seen by their parents and grandparents. Reared by single parent households headed by mothers or fathers, extended families, and cohabitating parents, the children of Generation Next are more tolerant of what constitutes a family and diversity in form is widely accepted. Gen Y plans to customize their work life to accommodate their own high expectations of what work can offer coupled with a plan for a pleasing personal life. 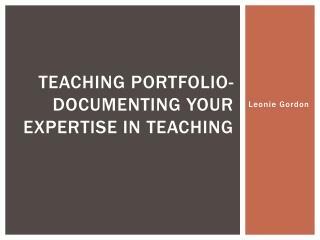 In this approach to customization, the expectation exists for supervisors to be supportive of Nexters’ goals toward balancing professional and personal lives (Kleiman, 2001). “With three to four part-time job or internships under their belts … this group is already sure they know what they want out of their careers and how they want to be managed” (Business Week Online, 2001). 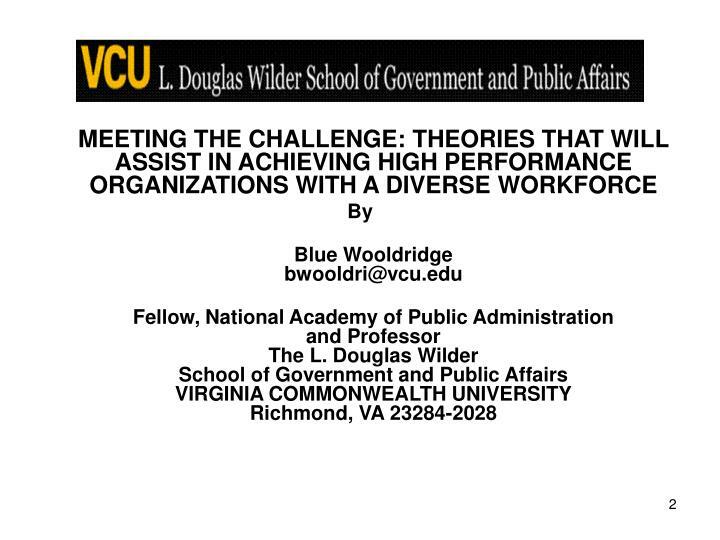 BUT ACHIEVING HIGH PERFORMANCE FACES CHALLENGES IN AN ORGANIZATION WITH A DIVERSE WORK FORCE. 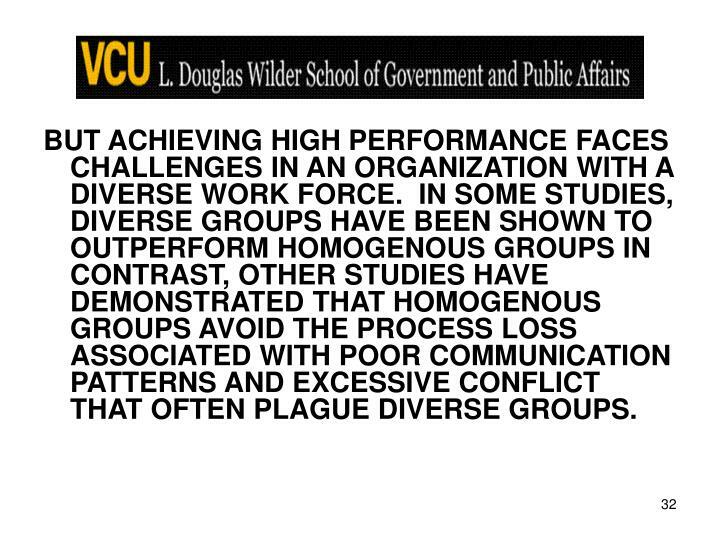 IN SOME STUDIES, DIVERSE GROUPS HAVE BEEN SHOWN TO OUTPERFORM HOMOGENOUS GROUPS IN CONTRAST, OTHER STUDIES HAVE DEMONSTRATED THAT HOMOGENOUS GROUPS AVOID THE PROCESS LOSS ASSOCIATED WITH POOR COMMUNICATION PATTERNS AND EXCESSIVE CONFLICT THAT OFTEN PLAGUE DIVERSE GROUPS. 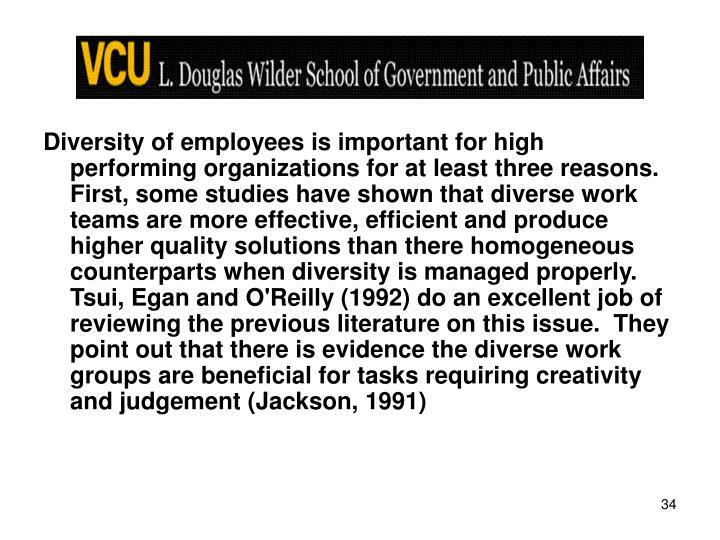 WELL IF THE RESEARCH ON THE RESULTS OF INCREASED WORK FORCE DIVERSITY ON ORGANIZATIONAL PERFORMANCE IS MIXED, WHAT RESEARCH SUGGESTS THAT A DIVERSE WORK FORCE IS FUNCTIONAL FOR HPOs, WHAT THEORIES WILL GUIDE US IN DEVELOPING COMPENCIES IN MANAGING DIVERSITY? 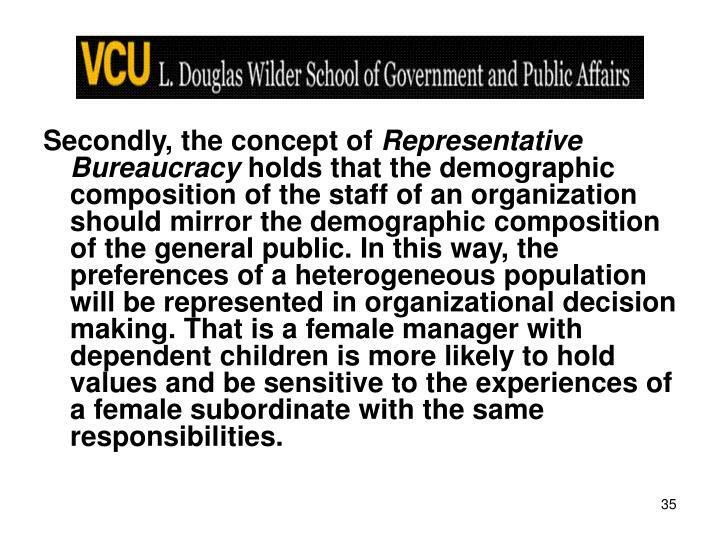 Secondly, the concept of Representative Bureaucracy holds that the demographic composition of the staff of an organization should mirror the demographic composition of the general public. 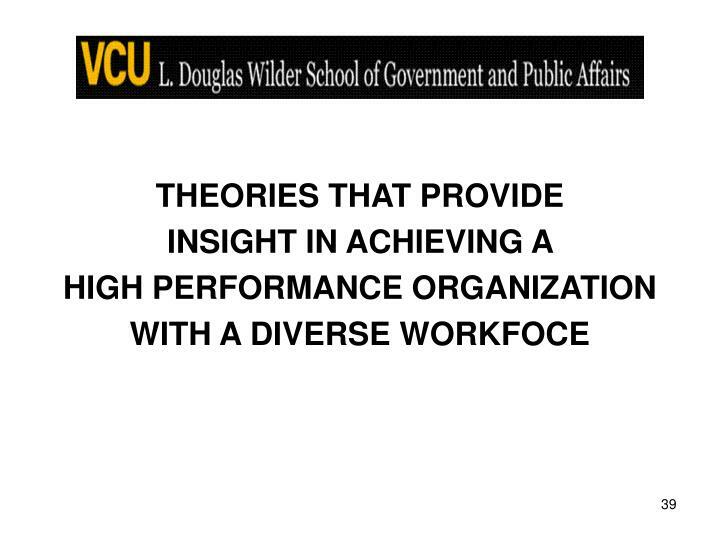 In this way, the preferences of a heterogeneous population will be represented in organizational decision making. That is a female manager with dependent children is more likely to hold values and be sensitive to the experiences of a female subordinate with the same responsibilities. 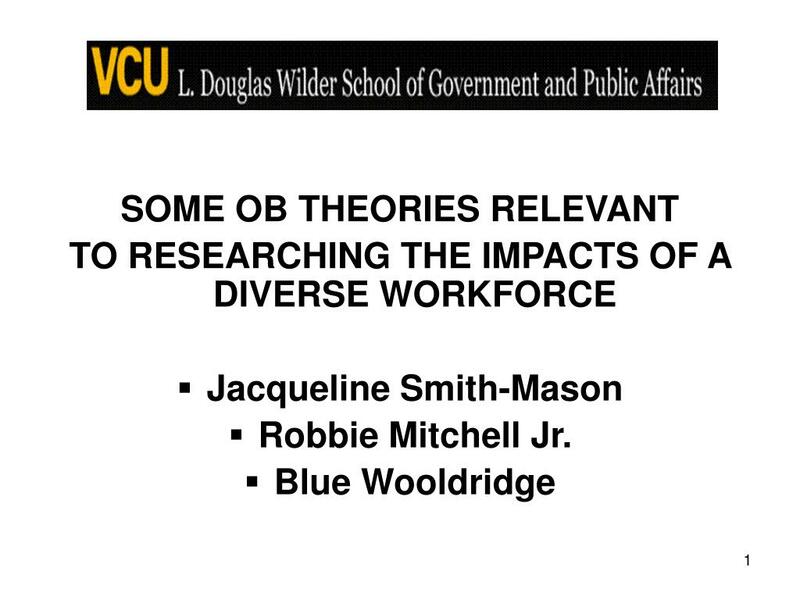 Finally HPOs need a diversified staff because of the concept of vicarious self-efficacy. Self-efficacy is an important element in individual performance, since belief that one has the capacity for producing a desired result is vital for motivation (see Vroom’s Expectancy-Valancy Theory of Motivation, 1964), and performance is a function of motivation, opportunities, role clarification and acceptance, and abilities (Steers & Black, 1994).Bandura also believes that the most important source of information concerning self-efficacy is personal performance accomplishment because it is based on personal mastery experiences. Successes raise mastery expectations. However, people do not rely on experienced mastery as the sole source of information concerning their level of self-efficacy. Many expectations are derived from vicarious experience. 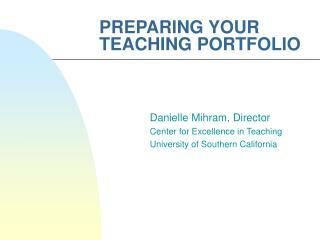 “Vicarious learning is learning that takes place through the imitation of other [role models]. That is, we observe and analyze what another person does and the resulting consequences. 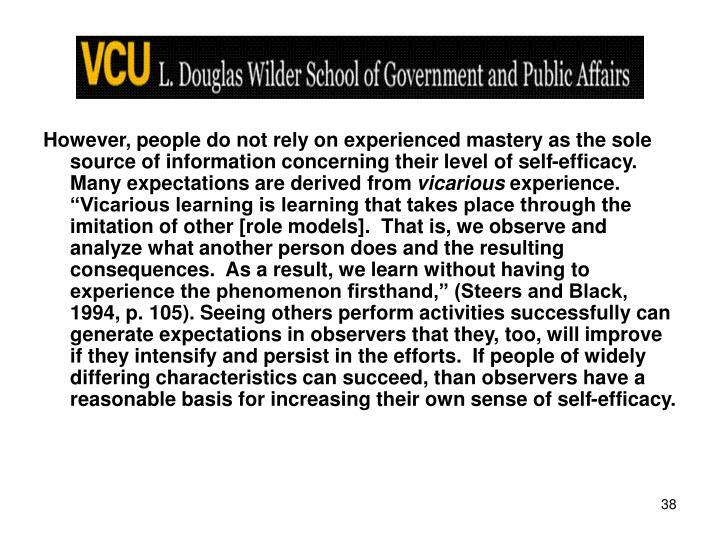 As a result, we learn without having to experience the phenomenon firsthand,” (Steers and Black, 1994, p. 105). 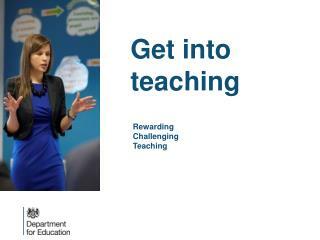 Seeing others perform activities successfully can generate expectations in observers that they, too, will improve if they intensify and persist in the efforts. If people of widely differing characteristics can succeed, than observers have a reasonable basis for increasing their own sense of self-efficacy. 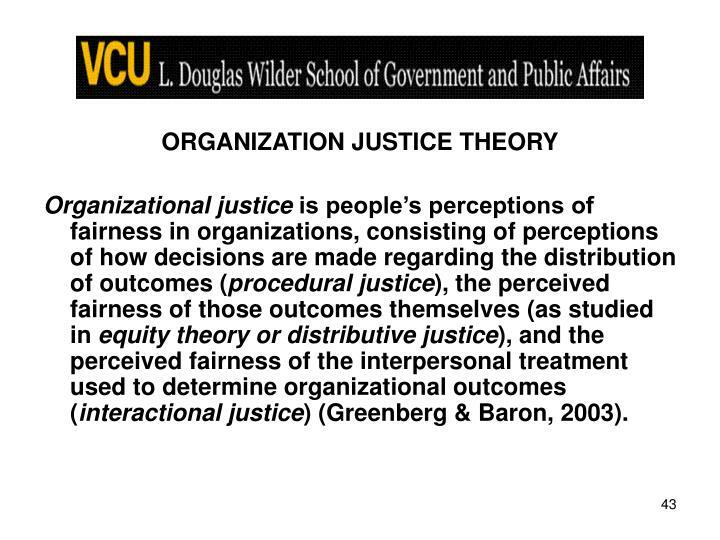 Organizational justice is people’s perceptions of fairness in organizations, consisting of perceptions of how decisions are made regarding the distribution of outcomes (procedural justice), the perceived fairness of those outcomes themselves (as studied in equity theory or distributive justice), and the perceived fairness of the interpersonal treatment used to determine organizational outcomes (interactional justice) (Greenberg & Baron, 2003). 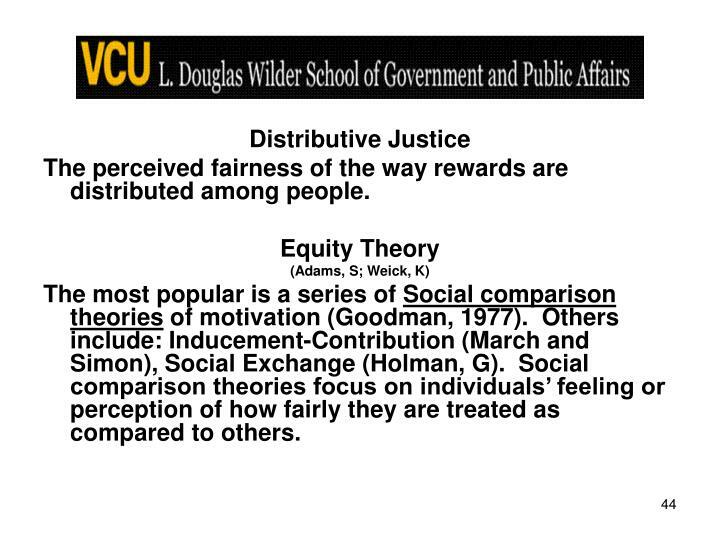 The perceived fairness of the way rewards are distributed among people. 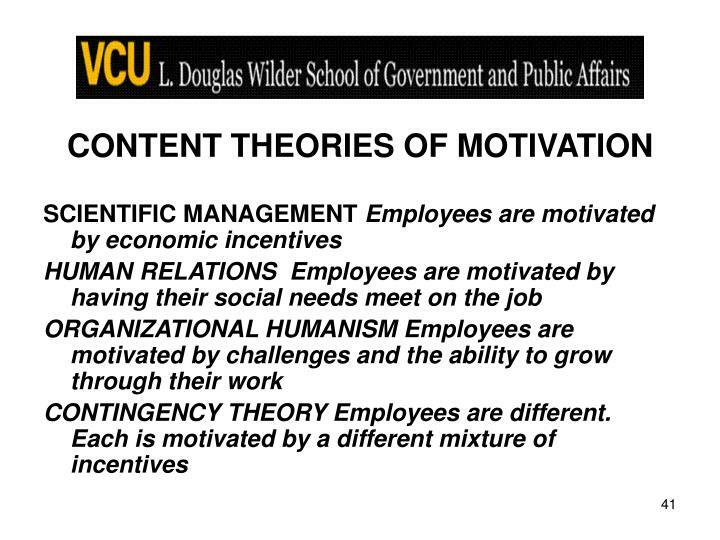 The most popular is a series of Social comparison theories of motivation (Goodman, 1977). 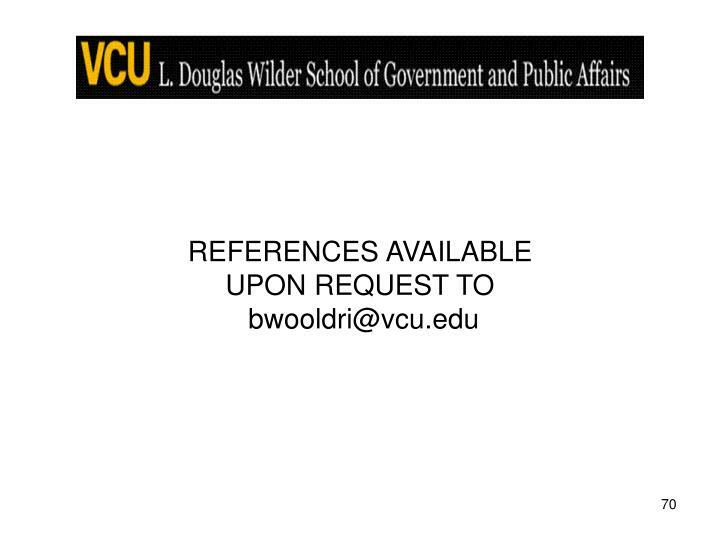 Others include: Inducement-Contribution (March and Simon), Social Exchange (Holman, G). Social comparison theories focus on individuals’ feeling or perception of how fairly they are treated as compared to others. 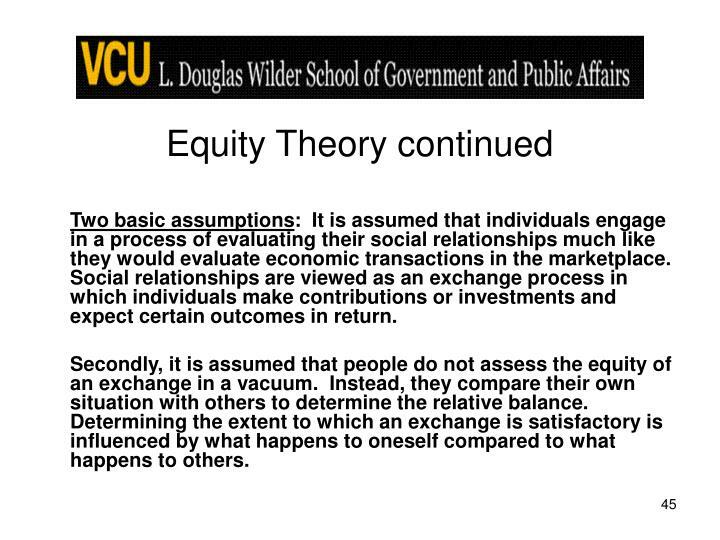 Two basic assumptions: It is assumed that individuals engage in a process of evaluating their social relationships much like they would evaluate economic transactions in the marketplace. Social relationships are viewed as an exchange process in which individuals make contributions or investments and expect certain outcomes in return. 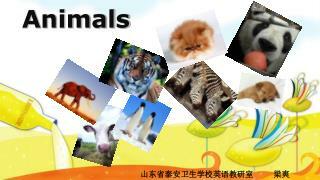 Secondly, it is assumed that people do not assess the equity of an exchange in a vacuum. Instead, they compare their own situation with others to determine the relative balance. Determining the extent to which an exchange is satisfactory is influenced by what happens to oneself compared to what happens to others. 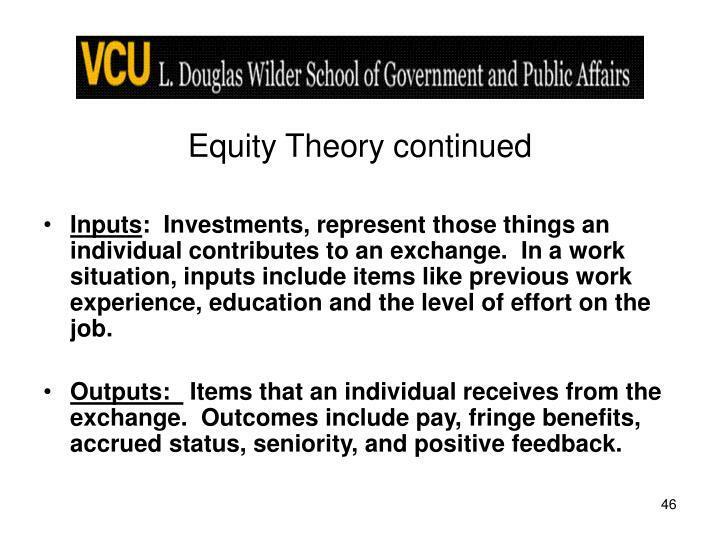 Inputs: Investments, represent those things an individual contributes to an exchange. 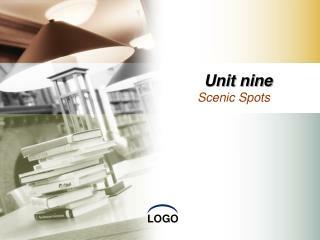 In a work situation, inputs include items like previous work experience, education and the level of effort on the job. Outputs: Items that an individual receives from the exchange. 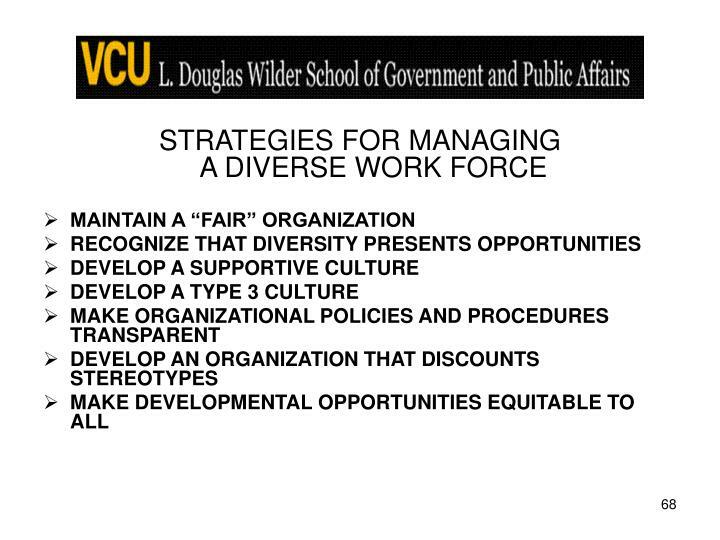 Outcomes include pay, fringe benefits, accrued status, seniority, and positive feedback. 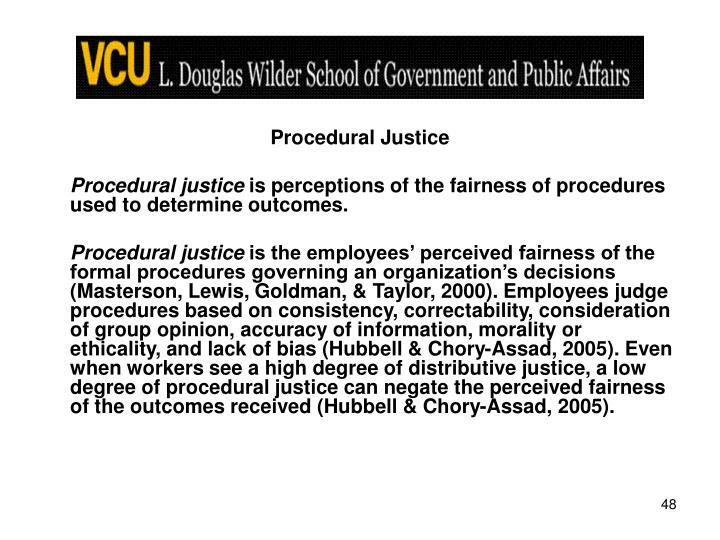 Procedural justice is perceptions of the fairness of procedures used to determine outcomes. 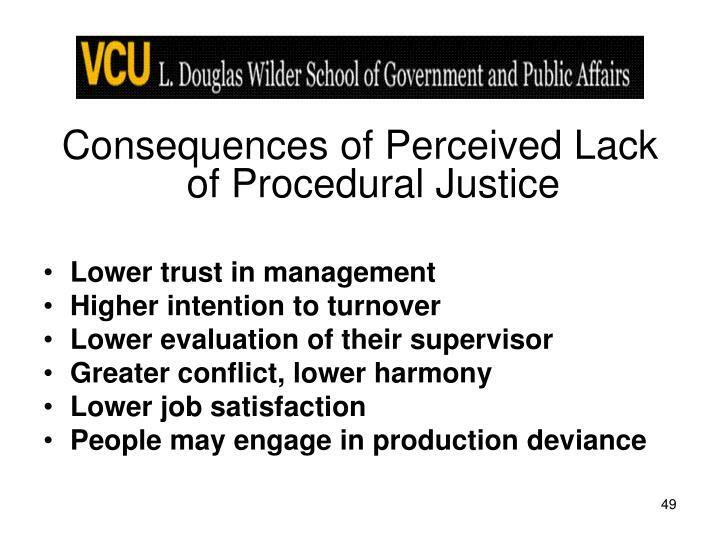 Procedural justice is the employees’ perceived fairness of the formal procedures governing an organization’s decisions (Masterson, Lewis, Goldman, & Taylor, 2000). Employees judge procedures based on consistency, correctability, consideration of group opinion, accuracy of information, morality or ethicality, and lack of bias (Hubbell & Chory-Assad, 2005). 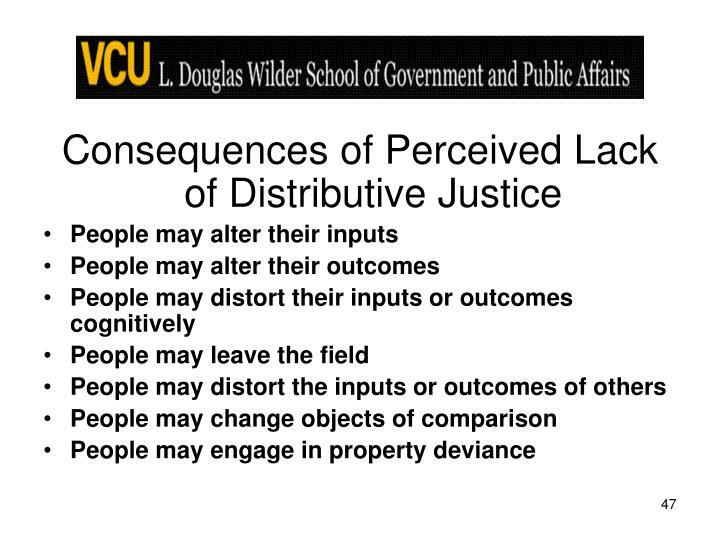 Even when workers see a high degree of distributive justice, a low degree of procedural justice can negate the perceived fairness of the outcomes received (Hubbell & Chory-Assad, 2005). 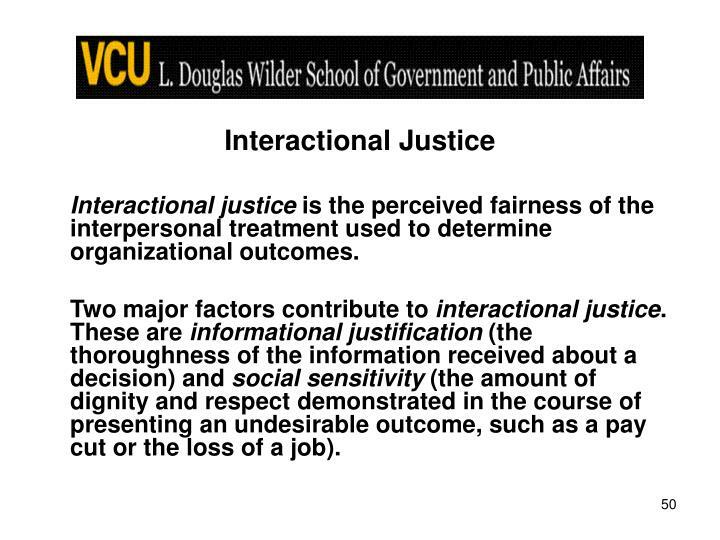 Interactional justice is the perceived fairness of the interpersonal treatment used to determine organizational outcomes. 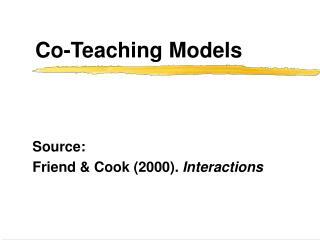 Two major factors contribute to interactional justice. 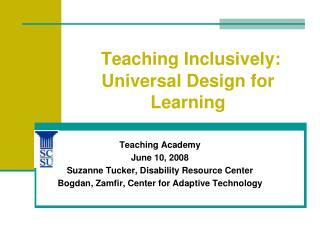 These are informational justification (the thoroughness of the information received about a decision) and social sensitivity (the amount of dignity and respect demonstrated in the course of presenting an undesirable outcome, such as a pay cut or the loss of a job). 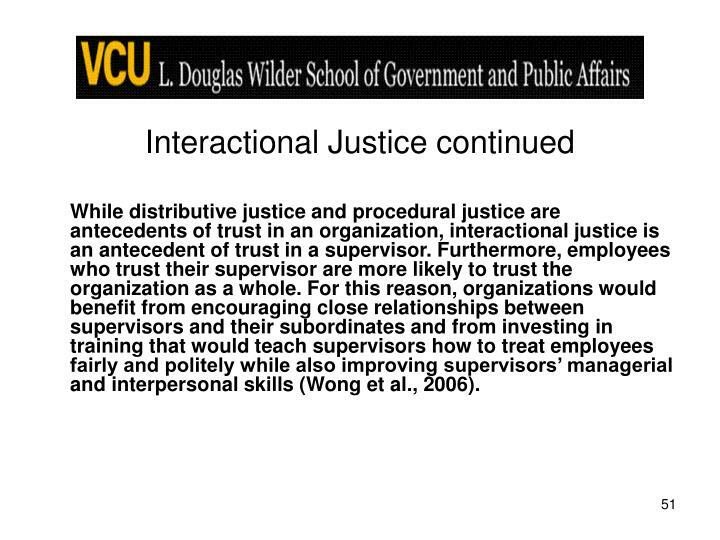 While distributive justice and procedural justice are antecedents of trust in an organization, interactional justice is an antecedent of trust in a supervisor. Furthermore, employees who trust their supervisor are more likely to trust the organization as a whole. 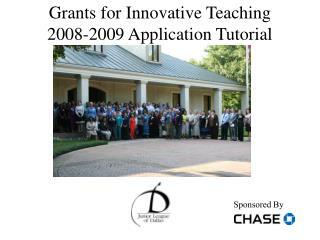 For this reason, organizations would benefit from encouraging close relationships between supervisors and their subordinates and from investing in training that would teach supervisors how to treat employees fairly and politely while also improving supervisors’ managerial and interpersonal skills (Wong et al., 2006). 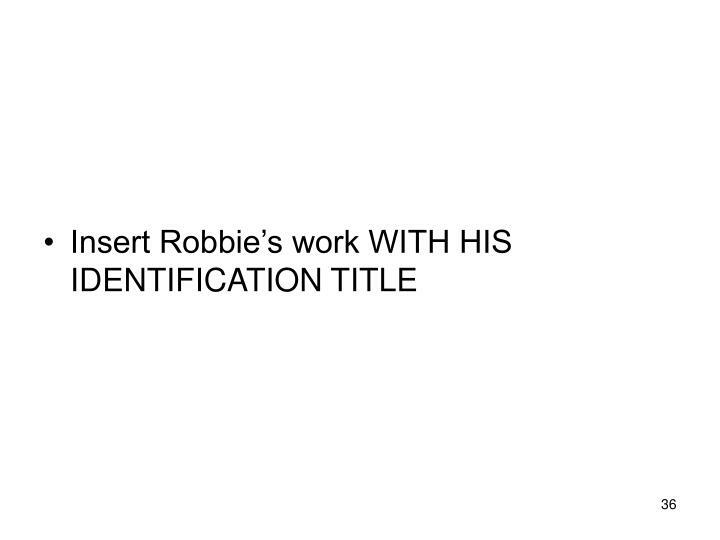 Informational justice, a term proposed by Greenberg (1994), claims that employees are more likely to label organizational procedures fair when the organization provides sufficient information to the employees explaining the reasoning behind the decisions made. 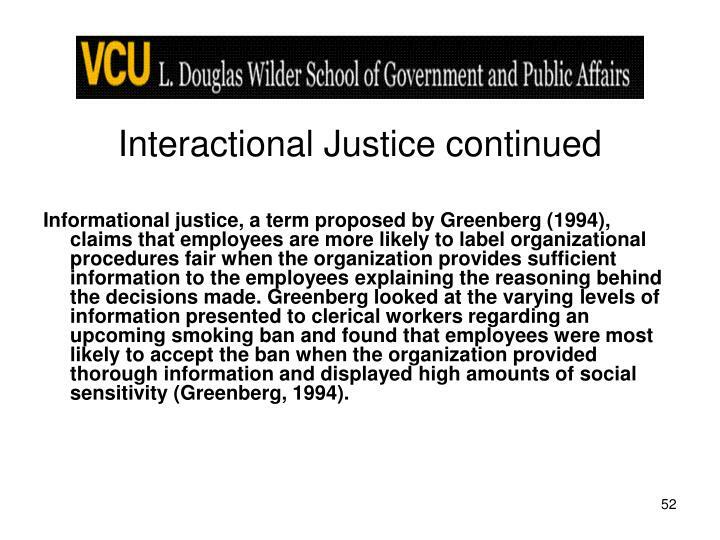 Greenberg looked at the varying levels of information presented to clerical workers regarding an upcoming smoking ban and found that employees were most likely to accept the ban when the organization provided thorough information and displayed high amounts of social sensitivity (Greenberg, 1994). 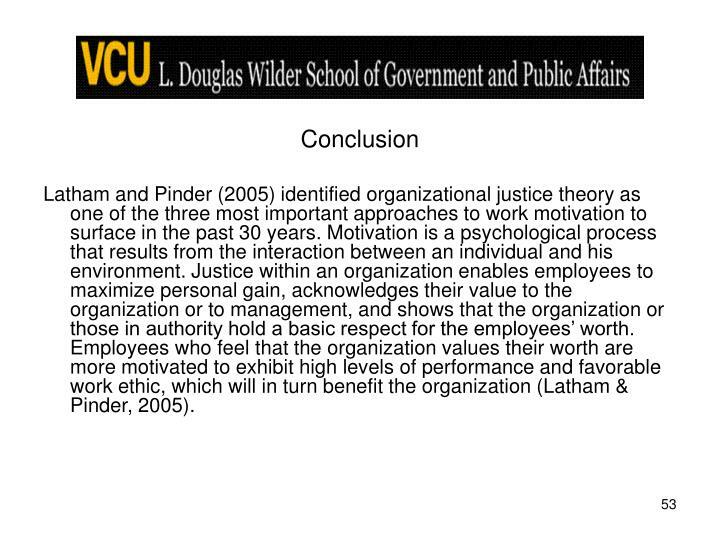 Latham and Pinder (2005) identified organizational justice theory as one of the three most important approaches to work motivation to surface in the past 30 years. Motivation is a psychological process that results from the interaction between an individual and his environment. Justice within an organization enables employees to maximize personal gain, acknowledges their value to the organization or to management, and shows that the organization or those in authority hold a basic respect for the employees’ worth. Employees who feel that the organization values their worth are more motivated to exhibit high levels of performance and favorable work ethic, which will in turn benefit the organization (Latham & Pinder, 2005). 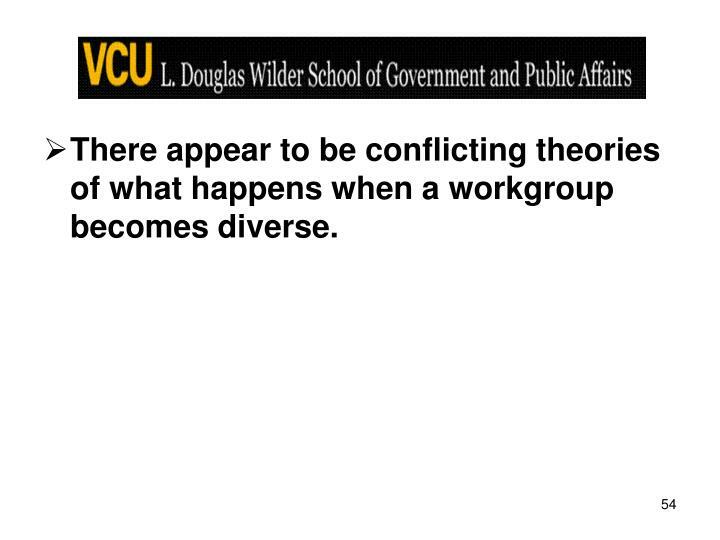 There appear to be conflicting theories of what happens when a workgroup becomes diverse. 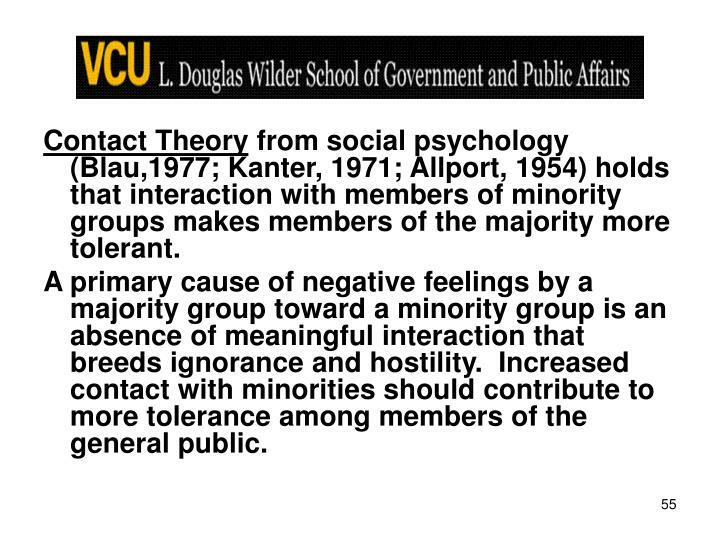 Contact Theory from social psychology (Blau,1977; Kanter, 1971; Allport, 1954) holds that interaction with members of minority groups makes members of the majority more tolerant. A primary cause of negative feelings by a majority group toward a minority group is an absence of meaningful interaction that breeds ignorance and hostility. Increased contact with minorities should contribute to more tolerance among members of the general public. 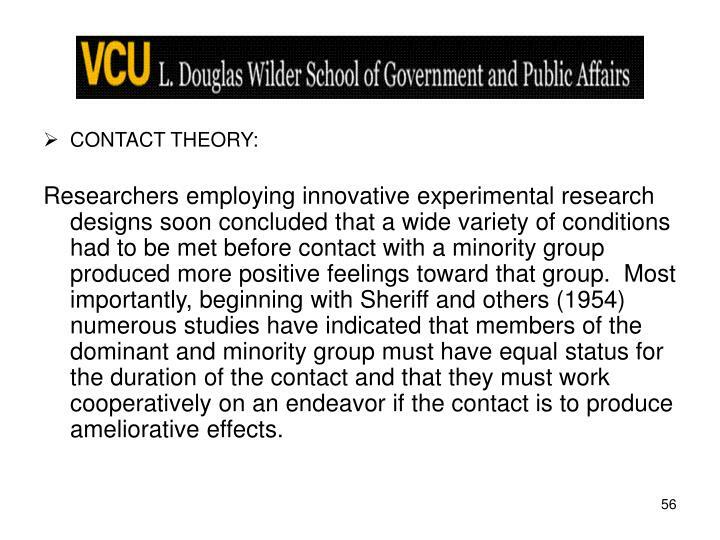 Researchers employing innovative experimental research designs soon concluded that a wide variety of conditions had to be met before contact with a minority group produced more positive feelings toward that group. Most importantly, beginning with Sheriff and others (1954) numerous studies have indicated that members of the dominant and minority group must have equal status for the duration of the contact and that they must work cooperatively on an endeavor if the contact is to produce ameliorative effects. 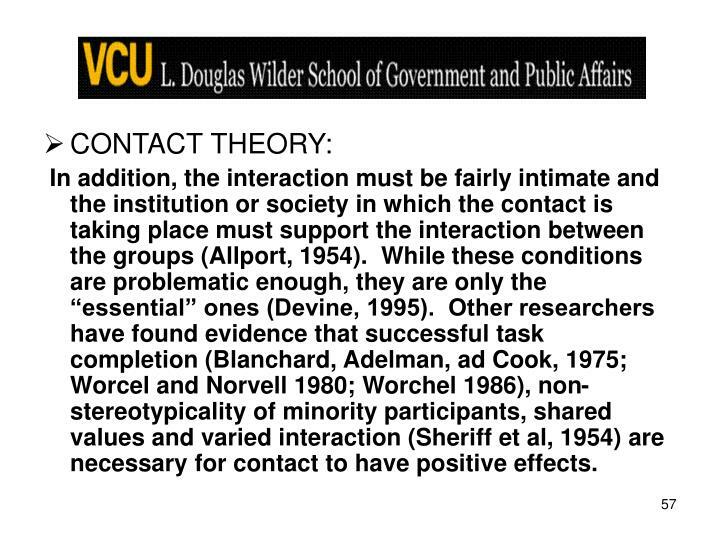 In addition, the interaction must be fairly intimate and the institution or society in which the contact is taking place must support the interaction between the groups (Allport, 1954). 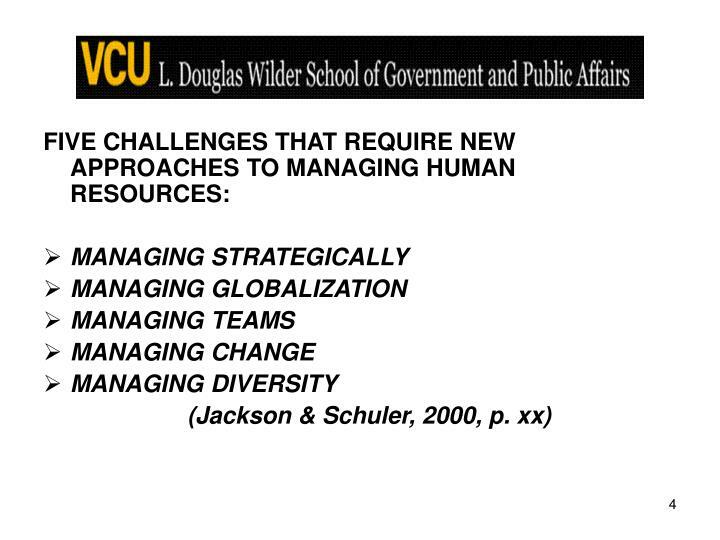 While these conditions are problematic enough, they are only the “essential” ones (Devine, 1995). 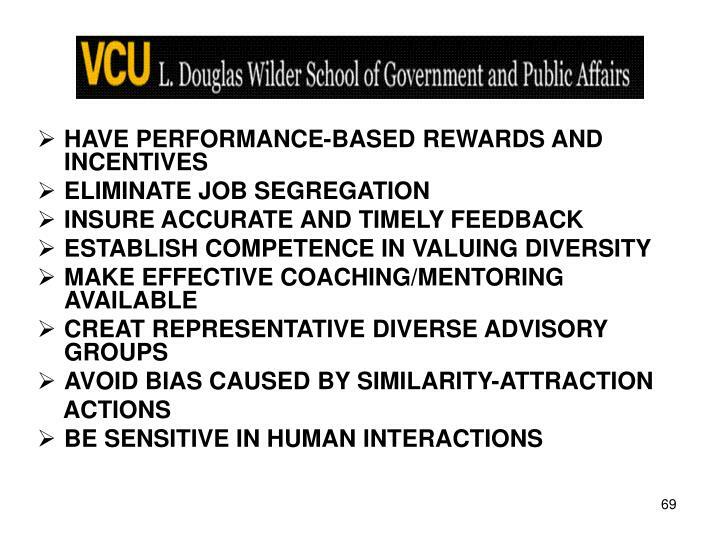 Other researchers have found evidence that successful task completion (Blanchard, Adelman, ad Cook, 1975; Worcel and Norvell 1980; Worchel 1986), non-stereotypicality of minority participants, shared values and varied interaction (Sheriff et al, 1954) are necessary for contact to have positive effects. 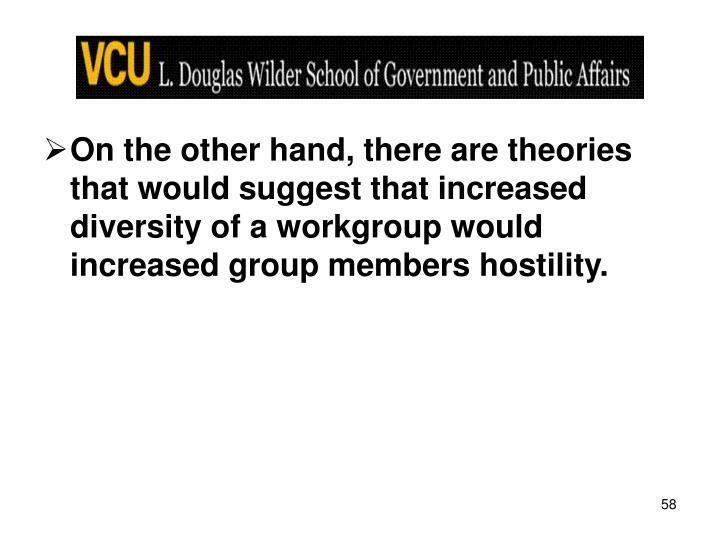 On the other hand, there are theories that would suggest that increased diversity of a workgroup would increased group members hostility. 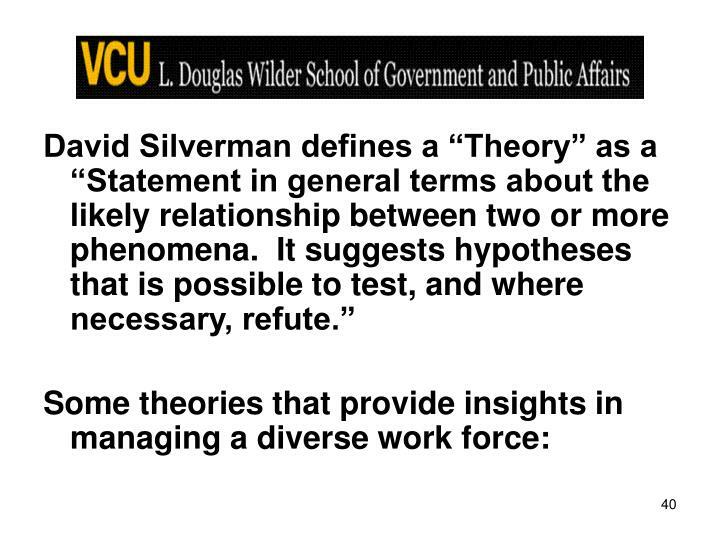 Social Identity Theory (S.T. 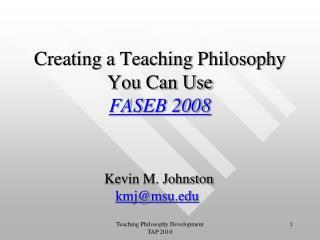 Fiske, 1993, Thornton, Tran and Taylor, 1997). 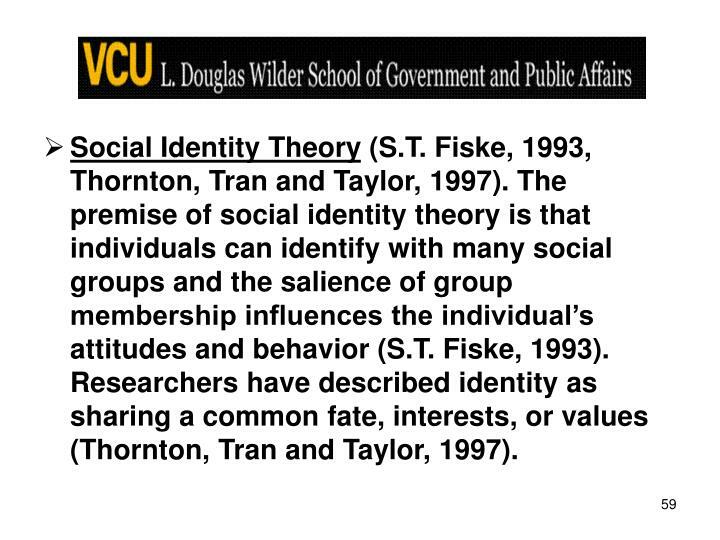 The premise of social identity theory is that individuals can identify with many social groups and the salience of group membership influences the individual’s attitudes and behavior (S.T. Fiske, 1993). 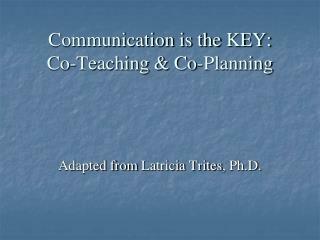 Researchers have described identity as sharing a common fate, interests, or values (Thornton, Tran and Taylor, 1997). 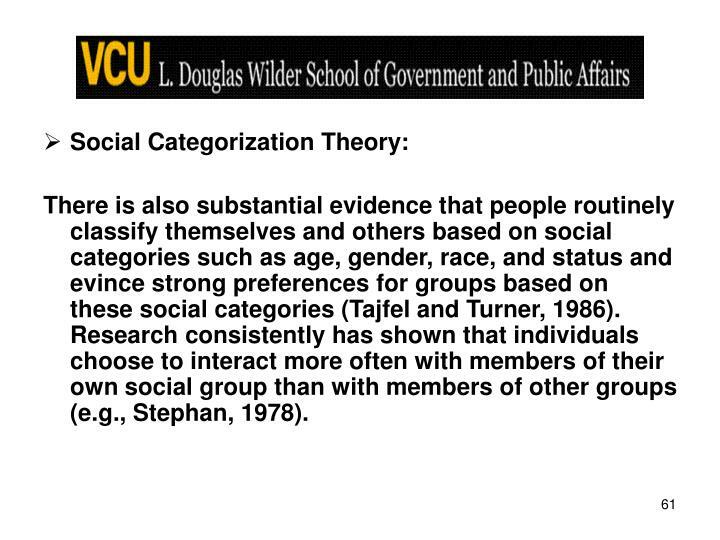 Social Categorization Theory (Tajfel and Turner, 1986; O’Reilly, Caldwell, & Barnett, 1989). This theory explains the role of social identity in the development of attitudes towards oneself and others. Social identify is established and maintained primarily through the process of differentiating oneself from individual who are outside one’s reference group. 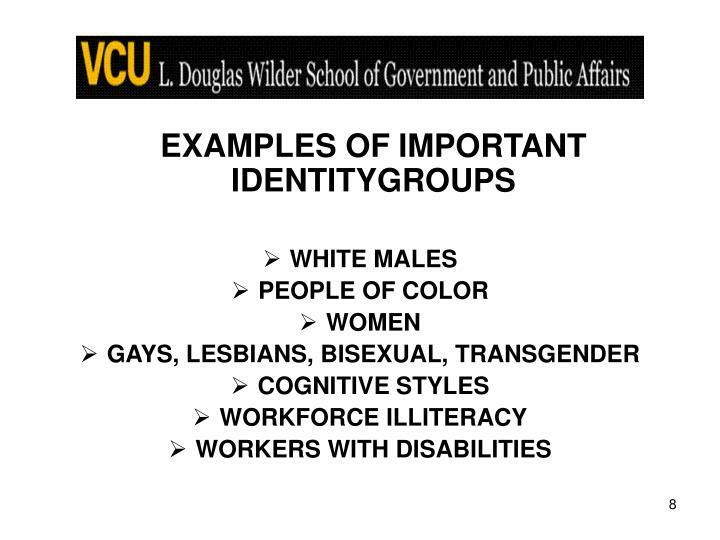 There is also substantial evidence that people routinely classify themselves and others based on social categories such as age, gender, race, and status and evince strong preferences for groups based on these social categories (Tajfel and Turner, 1986). Research consistently has shown that individuals choose to interact more often with members of their own social group than with members of other groups (e.g., Stephan, 1978). 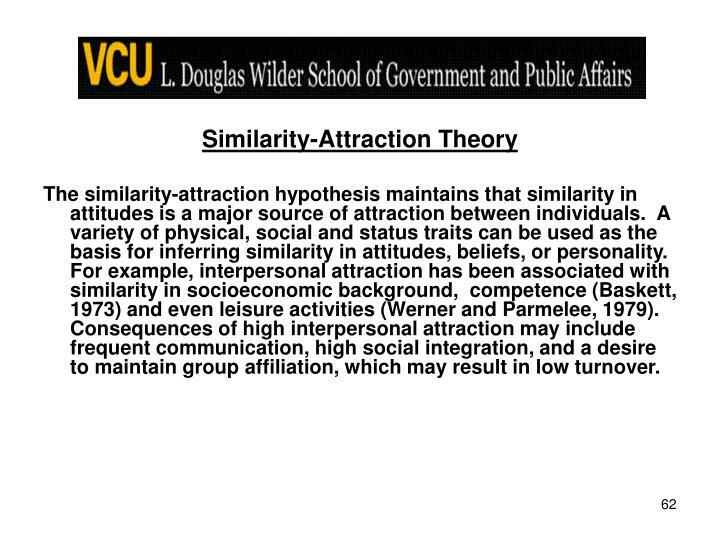 The similarity-attraction hypothesis maintains that similarity in attitudes is a major source of attraction between individuals. A variety of physical, social and status traits can be used as the basis for inferring similarity in attitudes, beliefs, or personality. For example, interpersonal attraction has been associated with similarity in socioeconomic background, competence (Baskett, 1973) and even leisure activities (Werner and Parmelee, 1979). Consequences of high interpersonal attraction may include frequent communication, high social integration, and a desire to maintain group affiliation, which may result in low turnover. 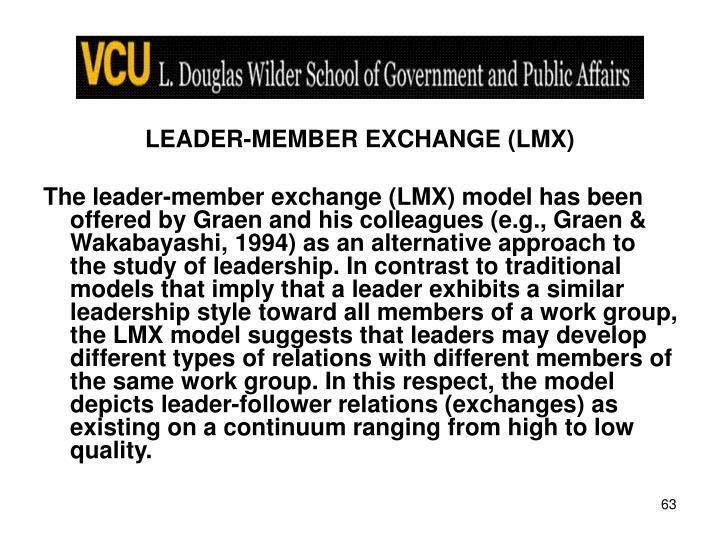 The leader-member exchange (LMX) model has been offered by Graen and his colleagues (e.g., Graen & Wakabayashi, 1994) as an alternative approach to the study of leadership. In contrast to traditional models that imply that a leader exhibits a similar leadership style toward all members of a work group, the LMX model suggests that leaders may develop different types of relations with different members of the same work group. In this respect, the model depicts leader-follower relations (exchanges) as existing on a continuum ranging from high to low quality. 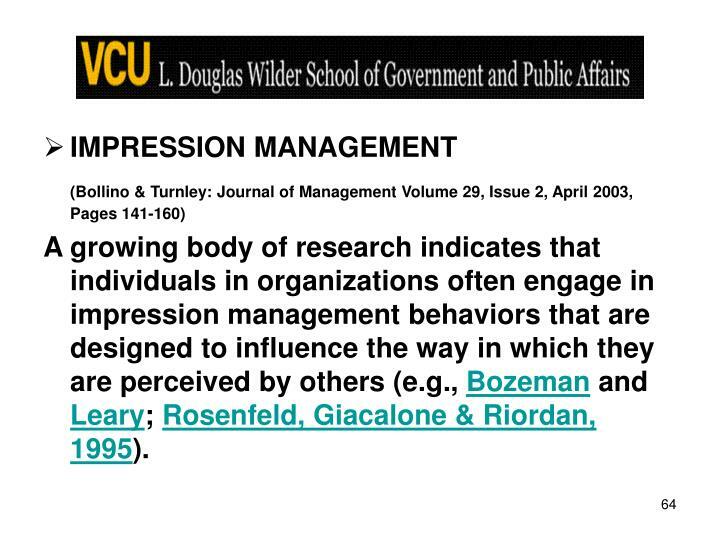 A growing body of research indicates that individuals in organizations often engage in impression management behaviors that are designed to influence the way in which they are perceived by others (e.g., Bozeman and Leary; Rosenfeld, Giacalone & Riordan, 1995). 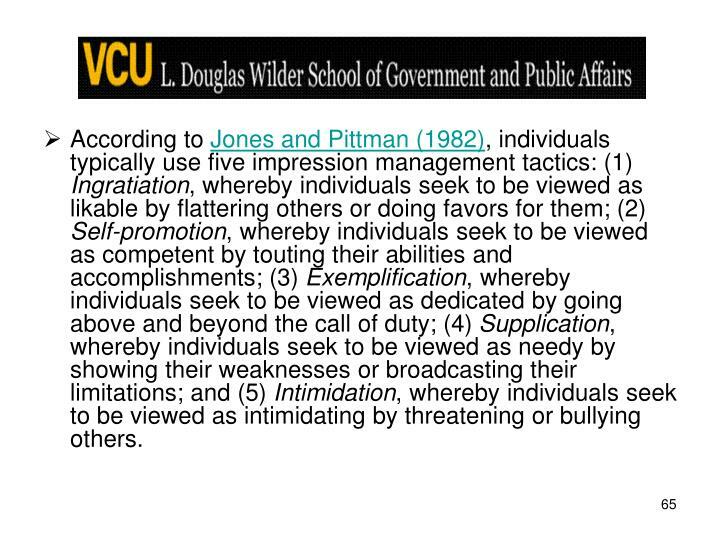 According to Jones and Pittman (1982), individuals typically use five impression management tactics: (1) Ingratiation, whereby individuals seek to be viewed as likable by flattering others or doing favors for them; (2) Self-promotion, whereby individuals seek to be viewed as competent by touting their abilities and accomplishments; (3) Exemplification, whereby individuals seek to be viewed as dedicated by going above and beyond the call of duty; (4) Supplication, whereby individuals seek to be viewed as needy by showing their weaknesses or broadcasting their limitations; and (5) Intimidation, whereby individuals seek to be viewed as intimidating by threatening or bullying others. DEMOTION-PREVENTIVE STRATEGIES After employees have been involved in a questionable behavior or activity, they will probably try to express themselves in ways that will reduce their responsibility for that action. 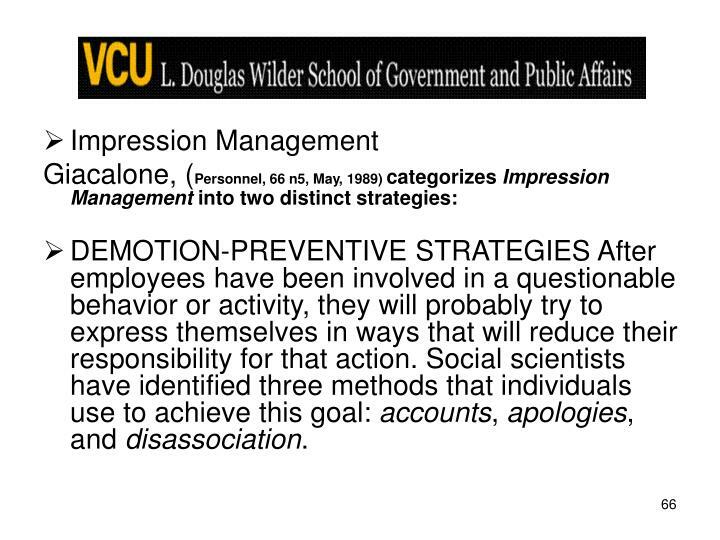 Social scientists have identified three methods that individuals use to achieve this goal: accounts, apologies, and disassociation. 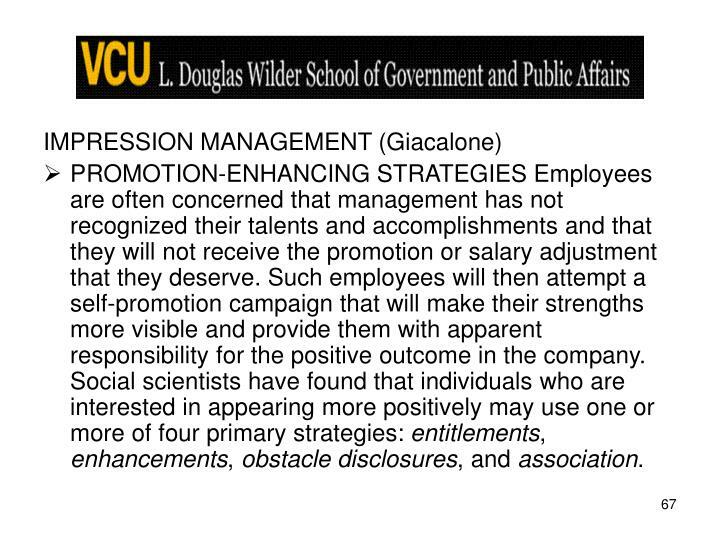 PROMOTION-ENHANCING STRATEGIES Employees are often concerned that management has not recognized their talents and accomplishments and that they will not receive the promotion or salary adjustment that they deserve. Such employees will then attempt a self-promotion campaign that will make their strengths more visible and provide them with apparent responsibility for the positive outcome in the company. Social scientists have found that individuals who are interested in appearing more positively may use one or more of four primary strategies: entitlements, enhancements, obstacle disclosures, and association. 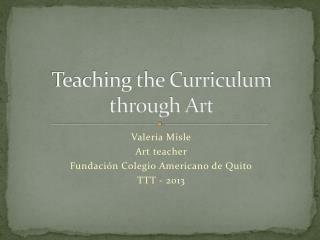 Introduction to the Scholarship of Teaching and Learning -. 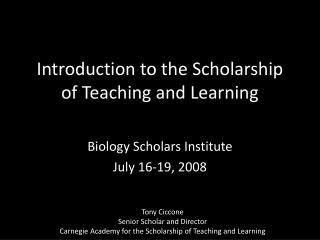 biology scholars institute july 16-19, 2008. tony ciccone senior scholar and director carnegie academy for the scholarship of teaching and learning. 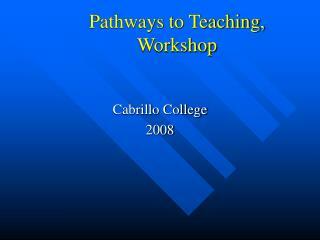 Research and Teaching Plans -. hen-i yang, phd candidate computer and information science and engineering department university of florida may 1, 2008. r esearch teaching. pervasive computing. pervasive computing applications.